Corno di Toro means "horn of the bull". 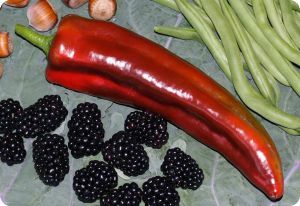 This pepper grows to 8-10" long and has a delicious, sweet and tangy flavor. It's my favorite pepper for eating raw. Corno di Toro Rosso pepper is an heirloom vegetable from Italy. It will mature a good crop in the northern states if started early indoors. Also known as Pepper 'Corno di Toro Red'.